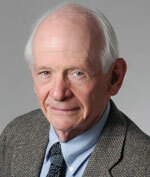 I was sorry to hear of the recent death of Ned Birdsall, Professor Emeritus at the University of California, Berkeley. I had met Ned on many occasions, at conferences and workshops. He visited Dublin a few times and I know that he and Prof. Miles Turner at DCU worked closely on a number of particle in cell studies. His book on Plasma Physics via Computer Modelling is a classic. During his early career Ned worked in Industry and has been awarded 27 Patents. He was clearly an innovative thinker and grounded in industrial applications. Interested in music, he was a keen walker and continued to run late into his life. At a conference a few years ago I can remember Ned heading of for his run, he looked like a man in his early sixties but at the time he was close to 85. I wish my sincerest sympathies to Ned’s wife and family. Everyone in the Plasma Physics community will miss him, ar dheis Dé go raibh a anam.